Exhibits like this make me wonder how we might interpret the remains of real aliens that future explorers could find on Mars or other distant worlds. Would our imaginations be able to come up with something more fantastic than reality? 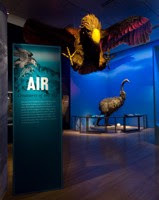 The exhibit will be at the Boston Museum of Science through March 22, 2009. Mythic EdGuide: exhibit guide for teachers (pdf). You know, I always find it interesting to consider what our ancestors thought about the world around them. They must have been so terrified when they saw things like Grizzly Bears, Giraffes, giant birds, etc. All those silly science fiction pulps from the 20s and 30s with giant animals in them were not exactly B.S. when you consider all the amazing creatures that went extinct around the same time as mankind was exploding with culture and technology (well, pre-industrial technology, at least). There were giant apes at one point! And now we have freaky alien squid in the ocean and all sorts of other bizarre and terrifying monsters that we're discovering every day. No wonder our ancestors came up with all those stories! What were they supposed to think? And it's not just that they were terrifying - there wasn't any photography to record what they were seeing. Considering the descriptions were passed by word of mouth - say from a villager in India to an Arab merchant to a European sailor and onwards, it's not too surprising that the descriptions were distorted. What a fascinating exhibit! I'm definitely going to see it. And I'll take pictures!